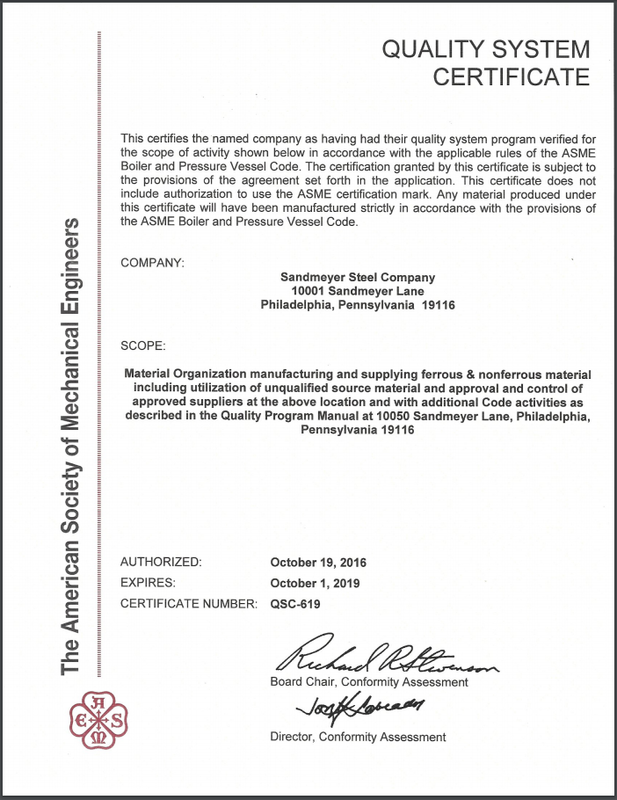 Sandmeyer Steel Company has designed and implemented a superior Quality Assurance Program to serve the quality requirements for material and value-added processes for multiple process industries. Whether your needs are Commercial, ASME Section VIII, Military, or Nuclear, Sandmeyer Steel is ready to not only meet but exceed customer expectations. In addition, we offer the industry’s top-ranked documentation package, and regularly conduct Corrosion, Grain Size, Hardness, Impact,Tensile and Ultrasonic tests. For more detail on our Nuclear Quality Program, click here. For more detail on our Commercial Quality Program, click here. For more detail on our Military Quality Program, click here. For more detail on Sandmeyer Steel Company’s Plate Thickness and Flatness tolerances, click here. If you have a specific quality-related question or request that is not addressed, please email us here and we will be glad to assist you.